I have been to Stonehenge in England, with my ex-wife Patricia. As I stood there in awe, I could faintly hear my ex-wife say, "those are just a bunch of rocks, I don't understand the fascination, come on, let's go shopping in London!" While I surveyed the countryside to Bath on the following day, I was looking for crop circles. Crop circles have a universal language of geometry. I believe that the ancient sites of England and leylines have something to do with the crop circle phenomenon. Somehow these crop circles are changing our perspective of life and our consciousness. Crop circles have been seen since the 7th century, before two guys appeared before BBC and made claim that they created the crop circles with sticks and rope. Could these two men that make this claim have created over 10,000 reported crop circles in 26 countries? 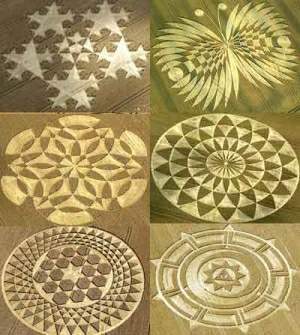 Crop circles that are so geometrically complex, that you have to be a mathematician with a genius level of intelligence to create them? For example there is a double helix of DNA strand type of crop circle, that would be impossible for humans to create. With a closer look the grain stems are arranged in a concentric manner. When entering a crop circle, knives, watches have been magnetized, people have felt tickling sensations on parts of their bodies and it appears that dogs, cats and other animals avoid entering a crop circle. People have heard twilling sounds coming out of crop circles. Before crop circles are formed, people report the appearance of UFOs, such as a tube of light, or small bouncing lights. It appears that the military is quite interested in crop circles, because the military has asked farmers to immediately harvest their grain even if it's ripe or not, so other people will not see the created crop circle. Are we being visited by the Circle Gods who leave their messages in fields of grain? When hoaxers try to replicate crop circles, they can't even get a circular precision down right, let alone complex symbols. The plants should be destroyed by the circle creations, but yet they survive. Upon closer inspection we see intricate designs that have been called the wreath, bird nest, cane hut, dorsal fin and the teardrop. One crop circle looks like our solar system in every detail, except that the Earth is missing. The complex Julia Set crop circle was created in broad daylight with witnesses around Stonehenge and it must have taken 1.17 minutes per circle to be created. Other circles are in 3D. People claim that UFOs appear anywhere from 6 to 36 hours before there are appearances of crop circles. The Circle Gods are trying to relay a message to humankind, they send down their silver colored spheres the size of tennis balls or beach balls to create these messages in the grain. Indigenous cultures have legends that discuss what the message could mean, it could mean that we are evolving into a more spiritual being. The Mayans claim that the world changes in 2012. The world as we know it will end in 2012. Perhaps after 2012, we will be more on a spiritual level on a spiritual quest of transformation. The Aboriginal people have legends of 'dream time', when people could walk from this reality into other dimensions. It is claimed that this is a lost science. Perhaps we will regain this knowledge and learn to change the molecular structure of things, including ourselves. We will be on the next level of awareness, we are entering the time of Homo Superious. 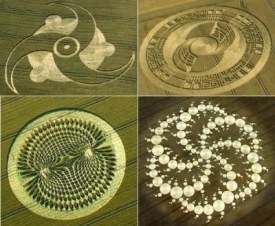 Perhaps the reason why crop circles are mostly seen in England, is because the Circle Gods want us to connect the dots, that ancient sites are connected to modern day crop circles. That our legends of fairy circles were also the enigma of what crop circles are today. On Milk Hill the Circle Gods left us a message in post-Augustan Latin and obscure Knights Templar based alphabet that read on this hillside..."I oppose acts of craft and cunning." Perhaps they were talking about our 2 guys that claimed to have made all of crop circles with sticks and rope. Or perhaps they are talking about mankind in general. I believe the Circle Gods have been around since the age of mankind. Mankind may have recycled itself 5 times over and we are heading for the 6th level of change over. The reason why I say we may be recycling is from ancient transcripts. It appears that mankind was at a level of technology, that was as developed as our own technology and they may have even exceeded us with technology. In 200 AD, the Chinese had an earthquake detection device. 1040 AD the Chinese had a flame thrower. Batteries were discovered that were 2000 years old in Baghdad. In ancient Egyptian hieroglyphics, there are images of lightbulbs. The Ark of the Covenant seemed to be radioactive. When a slave touched the Ark, he died immediately. Perhaps this was radiation poisoning? Was the Arc a weapon of some sort and also a communication device to God? Chi-Kung of Chinese legend was known to travel the skies in an aerial carriage. King Solomon flew around Central Asia. The 4,700 year old Babylonian Epic of Etana describes flying into outerspace and looking back at the Earth. The description is accurate. Have you heard about the flying Vimanas of India? There were three type of flying Vimanas. 3. Flying Vimanas that took you from planet to planet. If ancient technology from India, Egypt, China, Atlantis, Lemuria/Mu existed, then what became of this advanced civilization? It appears that there may have been a nuclear war. Mu and Atlantis sunk into the ocean, Sodom and Gomorra was obliviated into nothingness and tektites - hardened glass is found in the Egyptian desert that may indicate a nuclear war of some sort. There are even vitrified forts in Scotland and Iran that seem to indicate the ancients were ready and prepared for nuclear war. The world is in dire straights. With the threat of terrorism, crime, global warming, wars and the rumors of wars, new diseases arising, we are facing the Four Horsemen of the Apocalypse. It is time for the Circle Gods to step in perhaps once again and set us on the right course towards elusive harmony and bliss, before we destroy ourselves. Since the Circle Gods know that we have a tendency of destroying ourselves when we reach that peak of technical perfection, it was easy to lay down the prophesy to the Mayans that the world as we know it will end in 2012. Copyright © 2008 Paul Dale Roberts, HPI Ghostwriter Copyright 2008 all rights reserved. No part of this story may be used without permission.